Having read in the recent “Good Food Guide 2011” about the this small pub/restaurant I was eager to pay a visit. 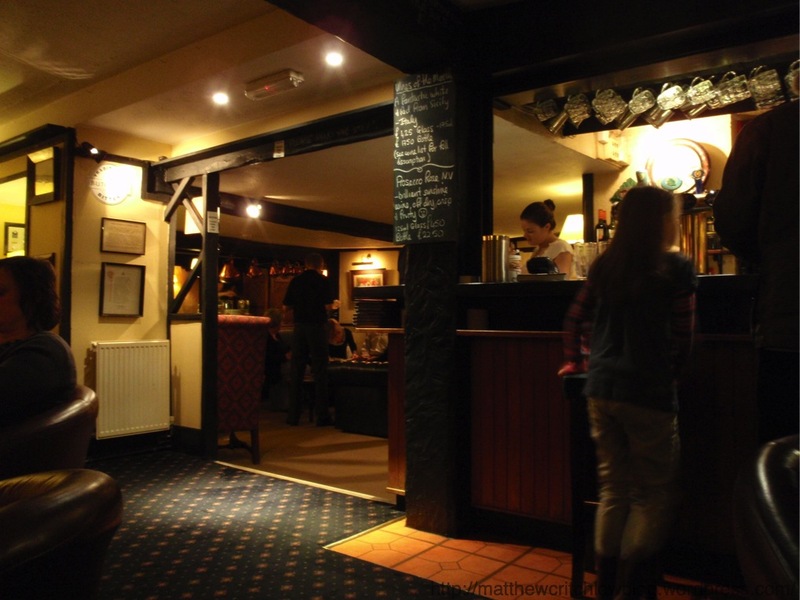 At first glance the online sample menu is a mix of Modern English with some Gastro-Pub elements, they also have a “Bar Menu” which is the old traditional pub fare. This restaurant again is going with the local produce approach and shows alot of willingness to use the most seasonal produce with a changing menu etc. The establishment in recent years are really moving up the ladder in terms of food, with various awards being awarded and the most recent change, being moved from 80th place to 52nd place in the top 100UK restaurants. 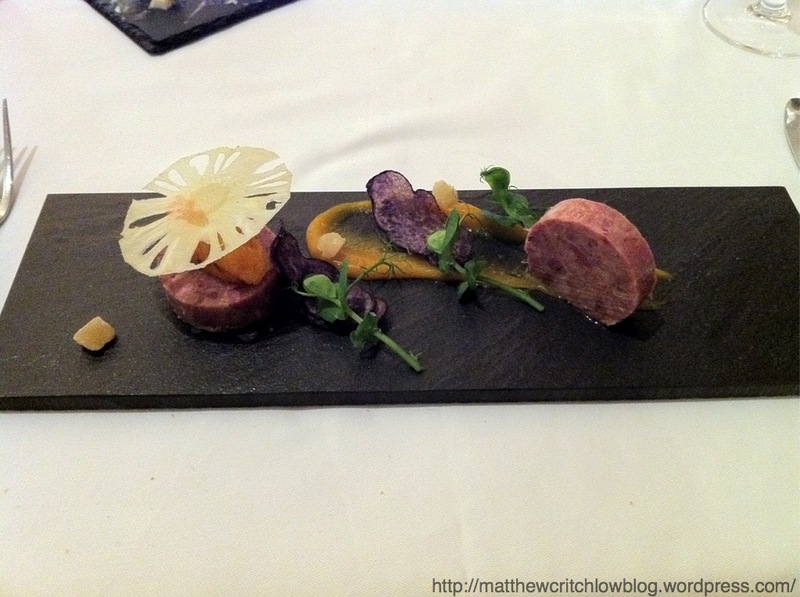 The chefs individually also won various awards with chef “Matthew Downing” being awarded “South West Chef of the Year”. Also within recent months they have added a Tasting Menu, I believe this shows the amount of effort these chefs are showing, in a attempt to move up the ladder of restaurants and really make this a well known place. 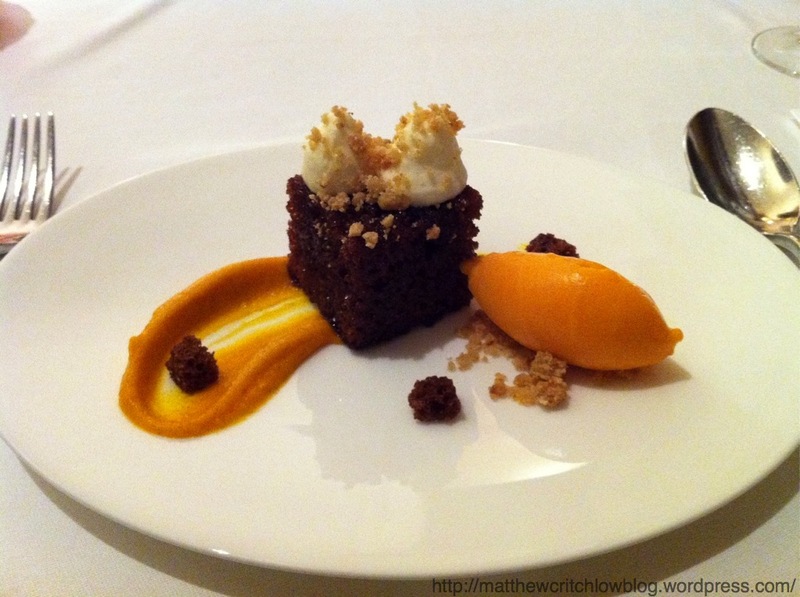 Here is an example of the tasting menu taking from November 2010. The restaurant is located on the outskirts of Exeter and is very convenient for travelers using the M5, as it is only 5minutes from the main Exeter turn off. It is not in a built up area and is placed in a green belt of lovely fields, guessing this is where the “in the Green” comes from in the name. From the external the building is what you would expect for any traditional country pub, with large signs and good located lighting. Upon entering you immediately walk into the pub/bar area, where a member of staff who is behind the bar greets you and shows you to available seats within the bar area. Drink orders are then taken and menus provided, this is a welcoming area to sit and relax while browsing through the menu with a good atmosphere. 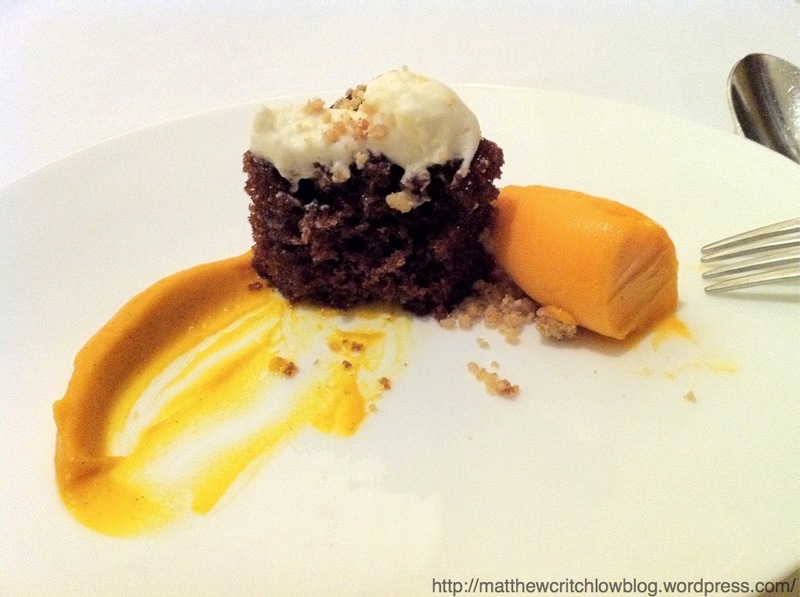 Usually if a tasting menu is offered this is the direction I would always go, however looking through the menu I noticed “Sticky Toffee Pudding” from the A la Carte. Immediately I had my mind made up that I would be sampled this dish no matter what, so the tasting menu was moved to one side for the A la Carte. 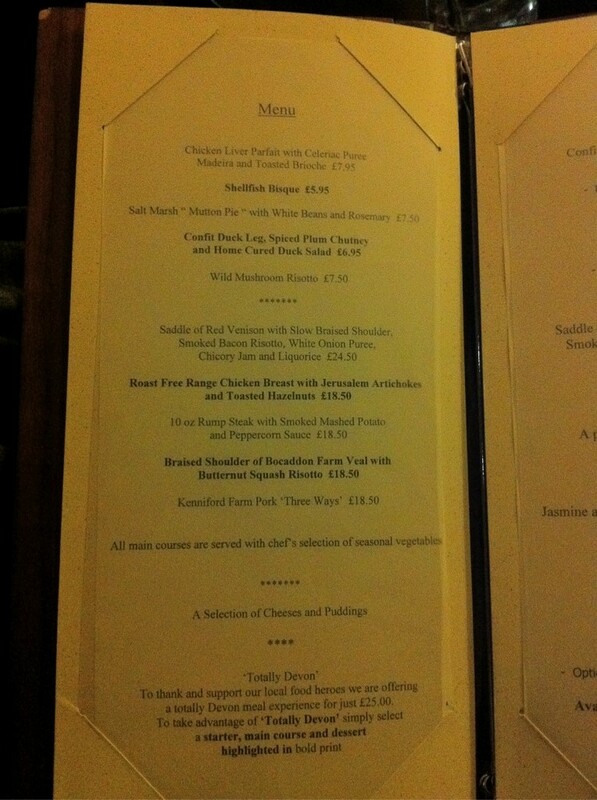 They offer a “Totally Devon” deal at the moment where they have highlighted items within the menu which if you combine these they form a deal of £25.00, unfortunately my main/dessert selections this evening were not on this offer. Within a few minutes our waitress returned and took our orders for the meal, she was extremely polite and well mannered, also when ordering our main she did well to enquire how we were happy with the meat cooked. After another 10minutes we were then invited into the main dining area, which is through some narrow passages and is decorated in much of the same way, with photos dotted around the walls and tables spaced well apart, but not to far apart to make a lacking of atmosphere. The bread and butter was already awaiting on the table. Bread on offer was standard white roll slices, with similar wholemeal granary slices, these were both good with excellent texture but nothing really jumped out to the flavour. 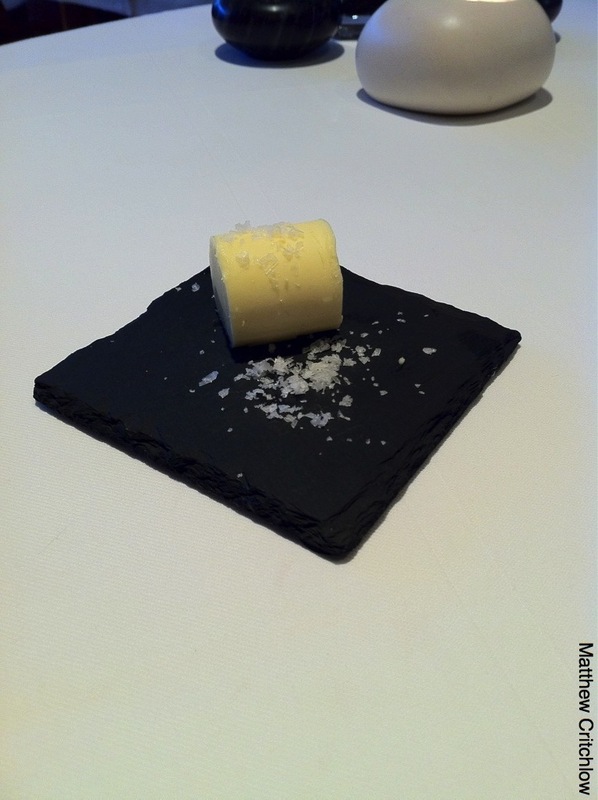 Butter on offer was extremely thick and creamy and cooled to a good room texture. 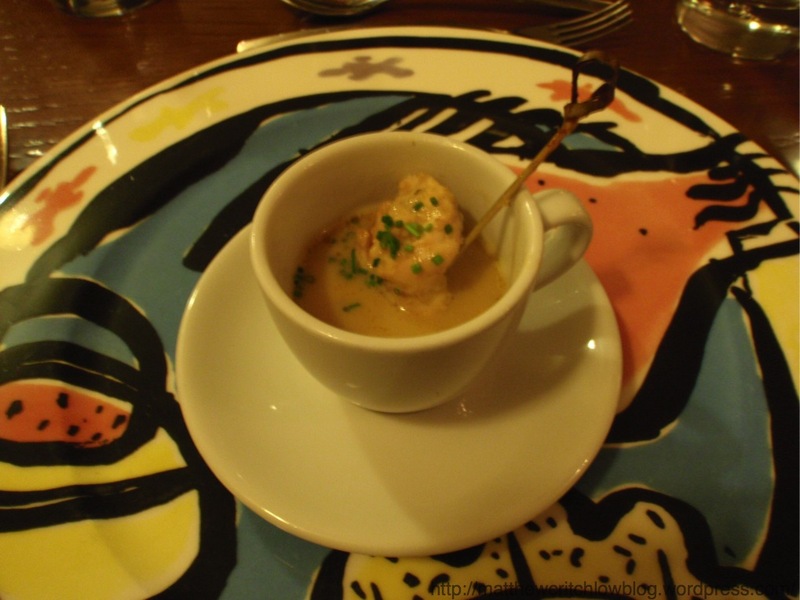 An Amuse Bouche was then served of “Chicken in a Thai Broth”, this was presented well with the chicken being on a small cocktail skewer. The chicken was moist and succulent and just fell apart when bitten into, the broth was also extremely flavoursome with excellent oriental flavours and abit of chilli kick on the back of the throat. 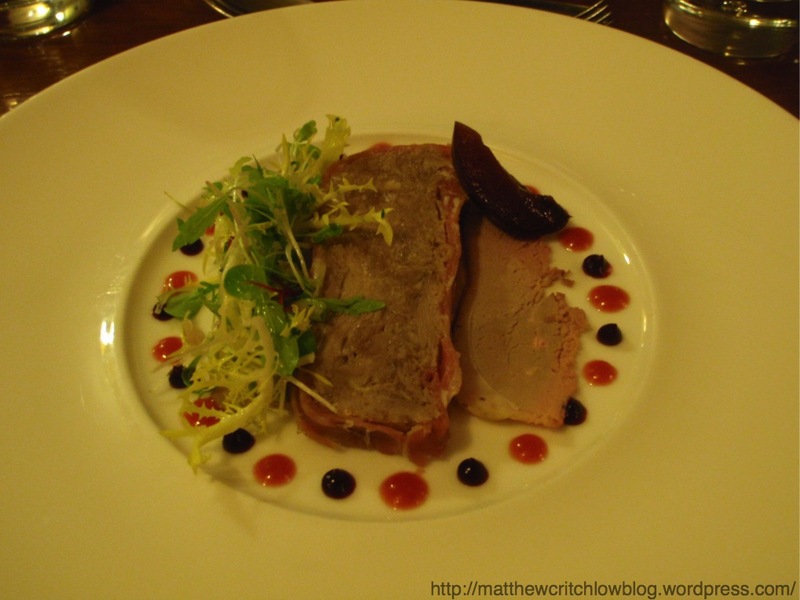 The starter was then served of “Confit Duck Leg, Spiced Plum Chutney and Smoked Duck Salad”, however when presented with the dish I was rather surprised and had to even re-read the wording of the menu. The “Confit Duck Leg” was more of a terrine which had been wrapped in thin bacon/Parma ham, and had an extremely strong and good flavour, however this was not what I was expecting and was confused not to see crisp confit leg. Also the “Smoked Duck Salad” element was thinly sliced duck breast which lay beneath the terrine with the salad being your standard micro-leafs placed on the side. The final element being the “Spiced Plum Chutney” again was very small dots placed around the plate. Overall I was left quite disappointed with the dish, not because of the lack in flavours from the duck as this was strong on both accounts, I found myself disappointed due to the chutney being more of a thin sauce and dotted around making it almost impossible to get any flavour. If the chutney was served in a side pot to allow a good quantity to be used I think this could be a very pleasing dish. 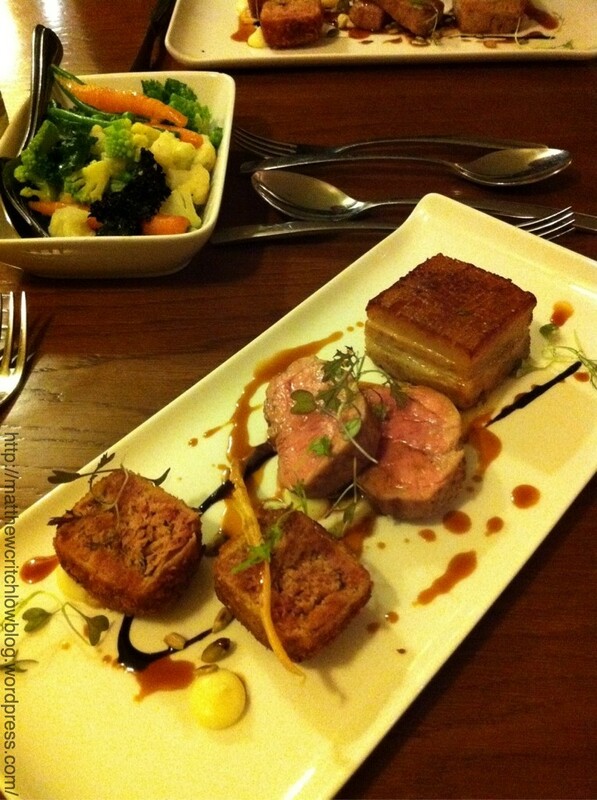 The main of “Kenniford Farm Pork ‘Three Ways’” was then served, this was presented very well and looked pleasing to the eye with vegetables served in a side dish. The first style of Pork served was a croquette, which I am assumed Ham Hock however unfortunately the waitress did not know, this had a brilliant flavour with a good crisp breadcrumb outer coating. The second cut was a pork loin which was served pink and again was extremely tasty, and very tender to cut. The final cut was the belly pork, which was the biggest disappointment as the fat was not rendered down enough, and was left soft and rubbery with what should be a crackling topping, this was not a good taste at all with the abundance of still white/un-rendered fat. Unfortunately the sauce provided placed beneath the loin, was a thin apple sauce, again this was only provided in the smallest of volume and this would have been nice to have more to get the true pork/apple flavour as the dish did seem to lack some sweetness. The mix vegetables provided were extremely well cooked with a good bite to them, and a good mix provided. Overall I was left disappointed with the dish mainly due to the belly pork, however I found the croquette extremely good. 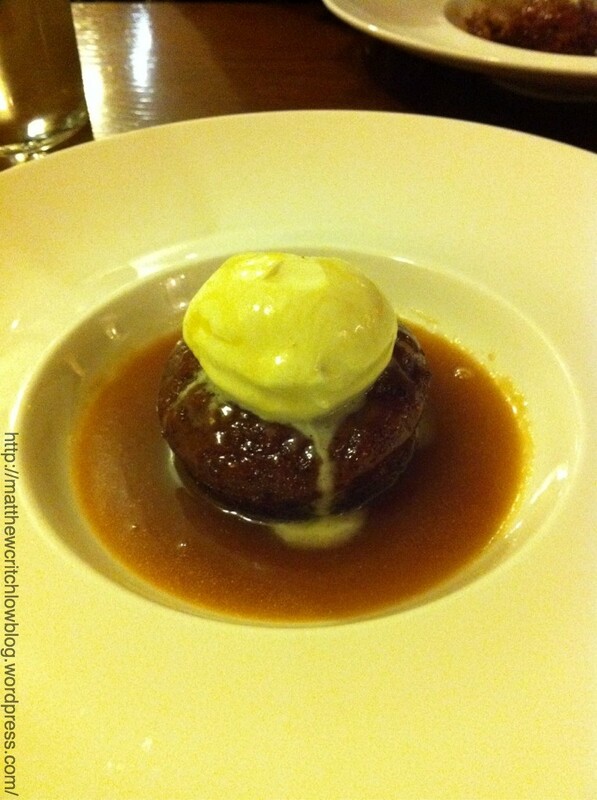 Dessert was then served of “Sticky Toffee Pudding with Butterscotch sauce and Clotted Cream “ I was immediately shocked by the size of dish, however this was not a disappointment as a large smile drew across my face. The sponge it self was lovely and dense, but without being too stodgy/clingy within the mouth and had a lightness about it, it was well formed and fully packed with lovely sweet and chewy dates. The butterscotch sauce may be one of the best I have ever tasted, it was not thin and could easily coat the back of a spoon, with the deep butterscotch smells/flavours radiating throughout. The large thick scoop of clotted cream also was brilliant, and had just started to melt and ooze down the side of the pudding when served. 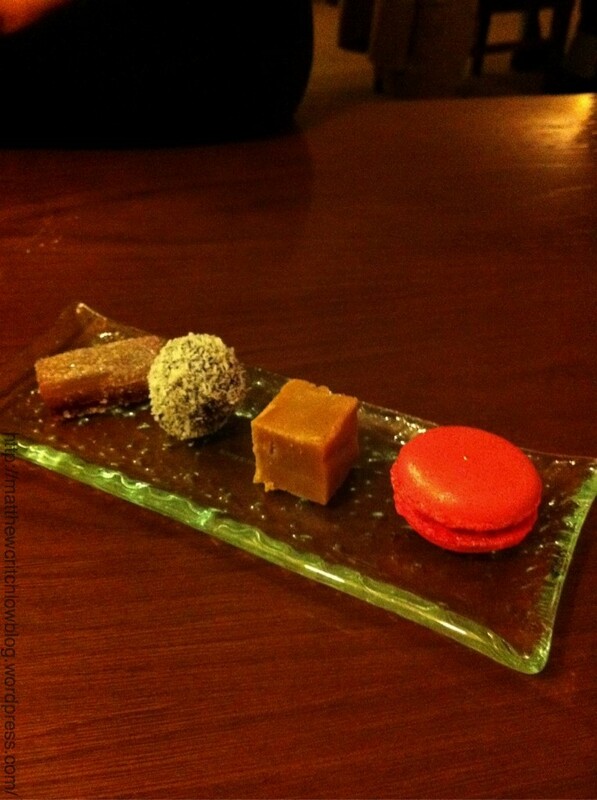 Coffee and Petit Fours were then served, my black coffee was deep and strong with a great flavour. The Petit Fours of Turkish delight, Ice Cream Coconut Chocolate, Vanilla Fudge and Strawberry Macaroon were all very good with the Macaroon being light as a feather and a small piece of strawberry jam/jelly placed in the centre. Service was very good for the entire evening with the meals being served with a good amount of time between, and also plates cleared accordingly. The staff were all very polite and worked well and not once did I a single one stop to chat to one another etc. A very welcoming addition as well which is rare to see in these times is a large jug of tap water already placed on the table without request. The total cost of the meal came to £69.58, which I believe to be slightly higher than what I would have liked to paid considering the above thoughts. I was slightly shocked to see at the end of the evening quite a low score on the bottom of my pad, as I had expecting this establish to score highly. I think due to the disappointment with the wording of the starter, which led my immediate disappointment when presented with it. Then followed by the main course which was also a slight let down with the pork being not cooked with a good crisp topping etc and the lack of flavour coming from the sauce etc. The highlight of the meal was dessert with a very well done pudding. I expected abit more from such a fast rising restaurant within the UK restaurant scene, with maybe just abit of “Wow” factor needed. I left the restaurant feeling full but underwhelmed, I would return however I will wait until a new season menu is produced to see if the worded is slightly more detailed. 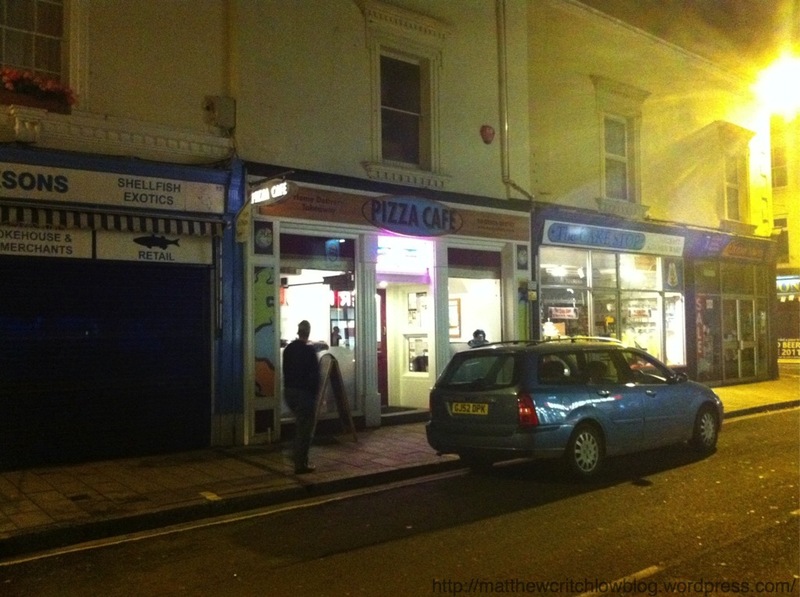 Having read about “Pizza Cafe” based in Newton Abbot (Devon) several times, throughout many different local food providers, it has been a place that has been on my list to review for a while. Any establishment I feel that cares and takes pride in the fact, that it goes that little bit extra and shows willingness to find and source the most local produce it can, is a great way to show what a quality establishment it is. On the Pizza Cafe website it is full of mentions of different suppliers from where they source Dairy to where their smoked salmon is sort from. 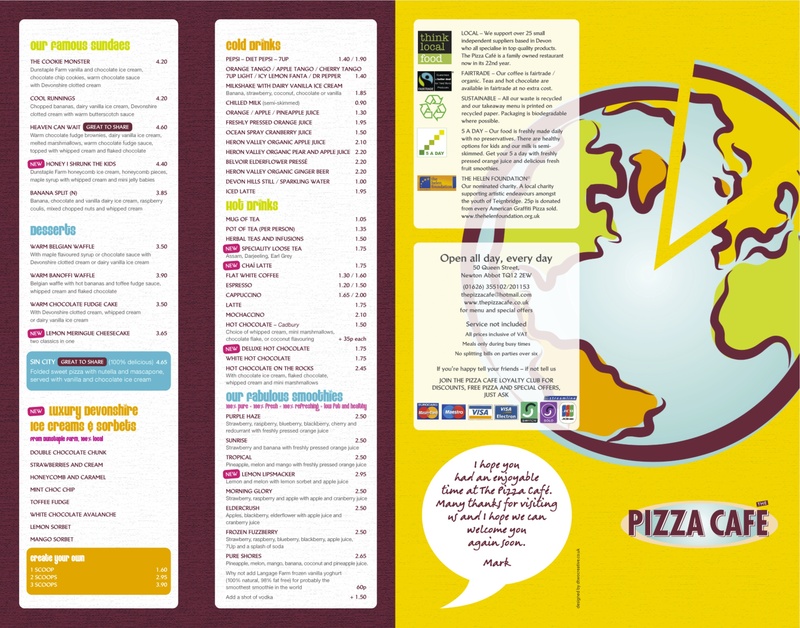 The pizza cafe does not seem like your regular local pizza eatery, from there website they pride them selves on quality, and take pride in that they are a family business, which also sponsor many different charities/appeals such as the “Helen Foundation”. 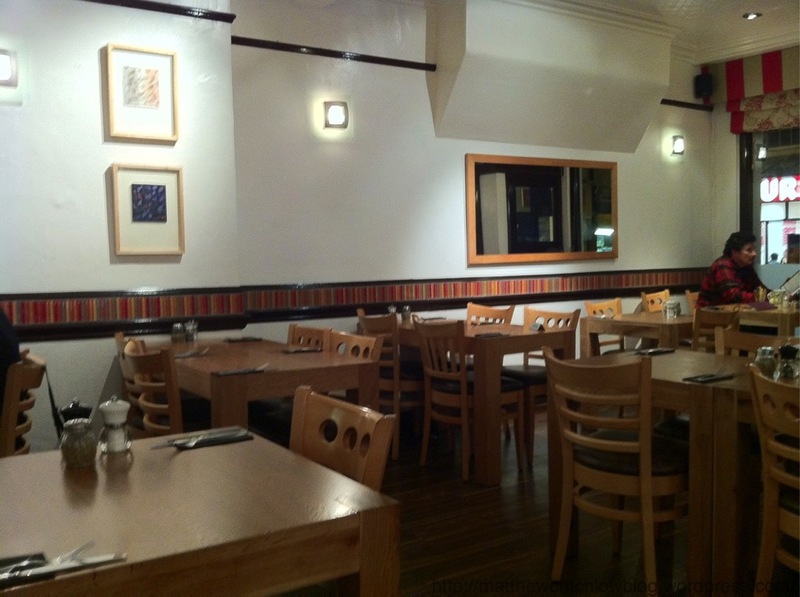 The restaurant is located on the main street of Newton Abbot, but luckily in the part which has parking local to it, and even directly outside. The building is painted in not the brightest of colours, however the pizza cafe logo is enough to make it standout. Upon entering the establishment you are presented with a light and airy dining area, with nice wooden tables and laid out well. We were greeted by a young waitress, who showed us to a table. The waitresses here are all quite young and dressed in smart black shirts and trousers, and are well suited to the restaurant. Upon being seated we were then shown the menus and drinks were ordered. Looking through the menu, I was immediately surprised at the size and some of the dishes here. Most of the normal pizza place fare is on offer, however some very different things such as “Prawn and Crayfish Salad”, “Peking Duck Wrap” and “Moroccan Tagine”, there are many different elements of the menu with Jacket Potatoes, Pasta, Wraps, Tex Mex, Salad and a host of different starters and then on top of this the Pizza selection, it really is a vast menu. Having scanned through we decided to go for a starter of “The Pizza Cafe Combo”, followed by a “Big Trouble in Little China – Snack Pizza – Plum Sauce, peking duck, spring onions and pineapple” and a “Porky’s – Sanck Pizza – Westcountry pineapple and onion chutney, slow roasted westcountry pork, caramelised onions, crispy bacon, chorizo and fire roasted yellow peppers” with the idea on splitting each pizza and sharing. My choice immediately was the “Porky” having such local produce on offer, and from the wording on the menu they make the pizza sound like a work of art. With my mouth water just at the thought of what was to come. They offer 3 different sizes here 7” (Snack), 9” Regular, 12” Large. These sizes are good however it would be good to have a size board on the wall somewhere, just to give customers an idea of size of what they are ordering. Being an engineer by day I had a good idea of the size and 7” seemed good, however the table next to us at the time ordered regulars each and half of these were taken away in pizza boxes. However this is a good time to note that you are allowed and encouraged by staff to take home doggy bags etc, this should be shown more willingness to do in restaurants and is a good thing. The restaurant at the time of entering was quite empty with only 3 tables taken, however by the time our food arrived, within about 15minutes the restaurant was now full with the exception of around 4 tables, which is impressive for a Monday night. This shows the popularity of the place. The first dish arrived, which we immediately divided between us and ill break the dish down here. The chicken wings, were beautifully cooked and spiced well with a small after taste of heat, the chicken was really succulent and tasty. The Criss Cross fries, had a great flavour and had a small hint of cheese, they were not crispy however had some small pieces which the taste was amazing (Crispy Bits). Onion Rings, these were pretty standard and im not sure if 100% fresh but again your standard fare on this one, but good non the less. The only real let down of dish for me was the potato skins which were just as describe, skins with about 4mm of potato, and nothing else as the menu stated, however I feel a small bit of melted cheese of maybe abit of tomato added would give these the edge. My sharing partner however thought they were perfect and just used alot of dip. The dips added well to the whole event with the BBQ being sweet and not a spicy sauce by any means, however good flavour and quite a musky aftertaste. The Garlic Mayo, was great and really thick, not watery and had a strong garlic taste, needless to say I quickly stole this pot to myself. The pizza arrived and I was very pleased we ordered the 7” versions. Immediately I was impressed how the pizza based was nice and thick around the edges, but surprisingly the centre of the disk was incredibly thin and had a good crisp bottom. The filling was certainly PACKED full, and the plum sauce was very sweet and not the traditional chinese, however it worked very well with the base. The duck was incredible, and if I didnt know better this was from a chinese shop somewhere, the skin was so crisp and crunched in the mouth. The spring onions had a good slight crisp, and the pineapple added a good sweet element but all this was all brought down to earth with the good base and deep taste of chinese duck. (Camera decided to Corrupt this, Will get on next visit and update). Now first I have to try and just describe the smell form this, it was a cross of amazingly crisp pork, mixed with the sweet smell of sugar coated onions and sweet cooked pineapple. Again the base was well risen around the edges and had even more filling on top than the previous, with the base coated with what must be spoons full of chutney. The chutney which was incredibly sweet and moorish was the star of the pizza, and I will certainly be asking them for where they source this from in Devon as it was AMAZING!. 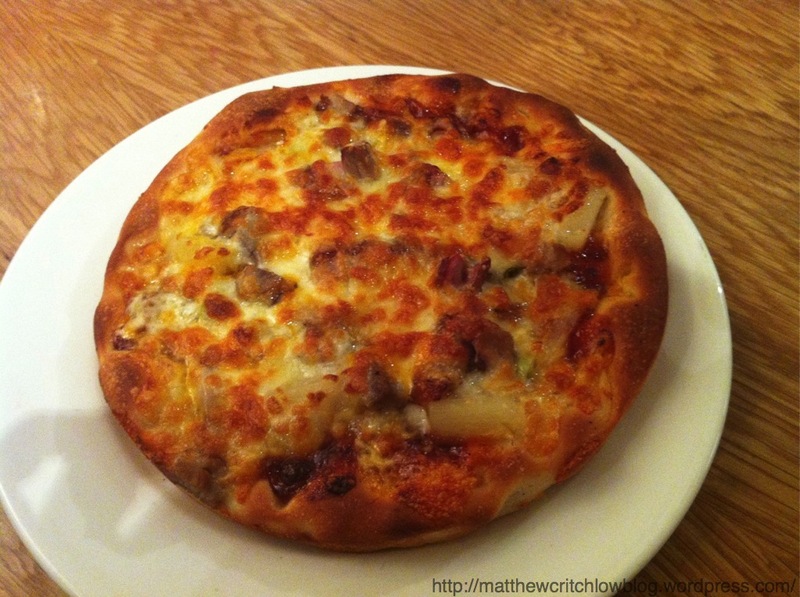 The chorizo added a new element to the pizza with a strong taste but mixed so well with the pork and cheese topping. Overall I could describe very moist, succulent and crispy parts of different pork elements, but I am so far just making my Mouth Water again. Overall this has to be one my top pizza’s ive had and has even taken the place of which once was the top of the list “Domino’s BBQ Texas pizza”, but this is the new favourite. The locally sourced and quality of ingredients really did show on this, and I really cant describe how nice it was. By the time I had eaten above I was needless to say stuffed, and just couldnt eat anymore if I wanted to. I had my heart set on the amazing “Sin City – Folded sweet pizza with nutella and mascapone, served with vanilla and chocolate ice cream”, however I just couldnt and will need to save this for my next visit. The service here on this evening was brilliant the waitresses are polite, charming and do their jobs well and dress for a small restaurant very well, and is where the restaurant shines with good personal service. This is the first meal in a while which has not been at a fine dining establishment, and for once it is a nice change to see a menu which has good hearty food without foams/mouses/foie Gras (Even though I love it so!). This was a brilliant meal with some truly great local food, the service was great and shows what a good small establishment can do. 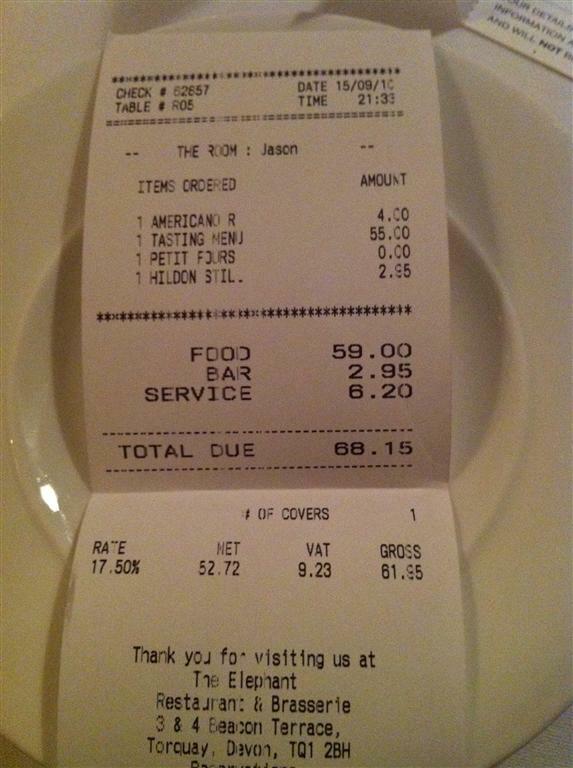 The bill came to a respectable £31.00 with drinks 2 Starters, 2 Snack pizzas and a Regular Pizza (Not mentioned about as was not allowed to sample these), this was without service and I payed £36.00 believing that this was very much deserved. I will definitely be returning to this restaurant, and in a way im glad my camera decided to corrupt the photo as its a great excuse to return quickly. The only criticism of the evening being the small disappointed with the potato skins but this is nothing to go on about and overall was a great dish. Update – January 2011 – The restaurant has now been fully re-opened under the new name of “Angelique”. When I visited in October this was under the new management/head chef of the “8 in 10 Group” and under its “Soft Launch”. Due to this I have updated the name in the title to reflect the visit, as of the time of dining it was under the new management/chefs and still applies. Well after not hearing about the well known chef “John Burton Race” leaving his pet restaurant “The New Angel” located in Dartmouth to concentrate on his TV career. I was surprised when logging on to the restaurants website to find that it had now been closed for some time and had now re-opened under the “10 in 8 Group”, it had also a title of “Michelin dining on a budget” with a tasting menu of 7 courses for £49, having seen the online sample menu I was impressed and decided to book a table. Having booked the table for 7pm and running slightly early I decided to enter at around 6:50pm, the front of the restaurant is very open with large clear windows for outsiders and diners to get a clear view of everything. When entering we (mother and me… Note must find foodie friends) were greeted by the head of front house, who was smartly dressed and seemed pleasant and was a rarity to find someone English of Origen, as front of house considering the style of restaurant. With our coats taken we were shown to our table and drinks order immediately taken. The front of house proceeded to give us the set tasting menus and having already asked for this over the phone previously he knew this is what I wanted. However out of curiosity I enquired about the “a la carte” menu, to this I was fed a large speech. The speech basically explained how the taster menu is the only current menu and if you did want it you must choose 3 courses from it, this is because when the restaurant opened they struggled with the different menus so have gone down this route for now. I’ll leave people to make their own views of this, as personally I think a restaurant should offer more than desert etc. An amuse Bouche of crisp whitebait and a salsa-Verdi was then served, this was a nice light bite, with the crisp fish having a good fresh taste. However the salsa-Verdi was very underpowered with little flavour even when sampled solo. Half way through sampling the above dish, butter was also presented on the table. At this point I’ll point out the main down fall of this restaurant which is the service but I’ll do a full report later below, but this is a small sample. I asked the foreign waiter who I believe was French from his accent if the butter was made “In House” or local? The response I got is as follows…. “(large laugh) the butter? Ofcourse not! (confused and slightly aggressive look on his face)”. Now I was slightly confused by this and not sure if he was just trying to be clever or not, so asked again where he then confirmed it Is not. More on service later. 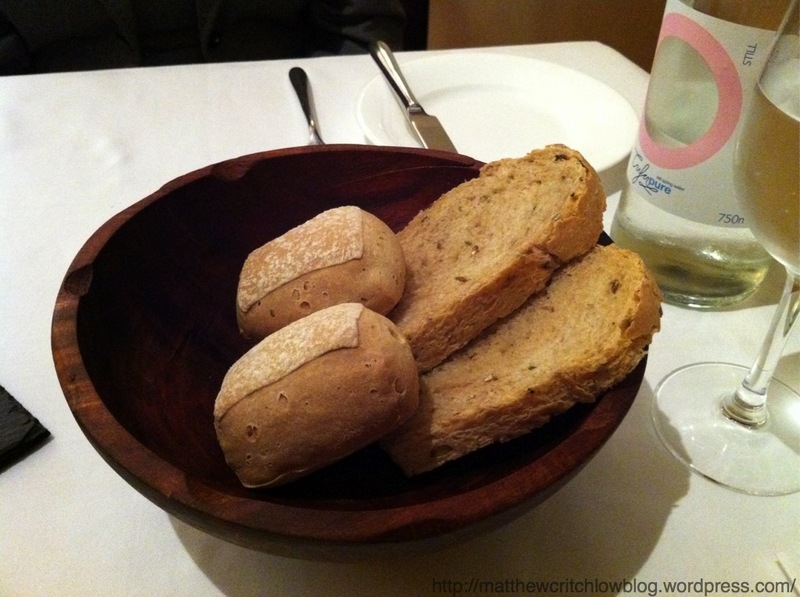 With plates now removed, a bowl of warm home made bread was presented. This consisted on 2 White hard crusted rolls and 2 fennel flavored thick slices, the white bread was good to cut with a nice dry and crisp exterior, however the interior bread was undercooked with this being very chewy and having no bounce or spring to touch. The wholemeal slices however were very good with good aniseed flavours. I will refuse to comment on the butter here as for all I know this could be Lurpak, with some shards of sea salt scattered on top. 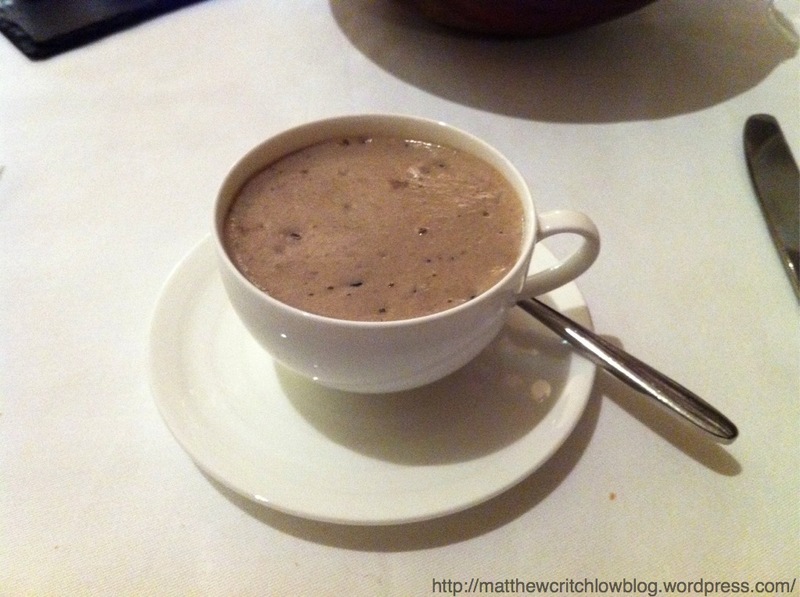 In between picking up my first roll our second amuse Bouche was placed before us of a “Wild Mushroom Foam”. This was very good and light with the entire cup being made of foam and not half with a pool of liquid on the bottom. This tasted exactly how it should, plain mushroom and nothing special here. 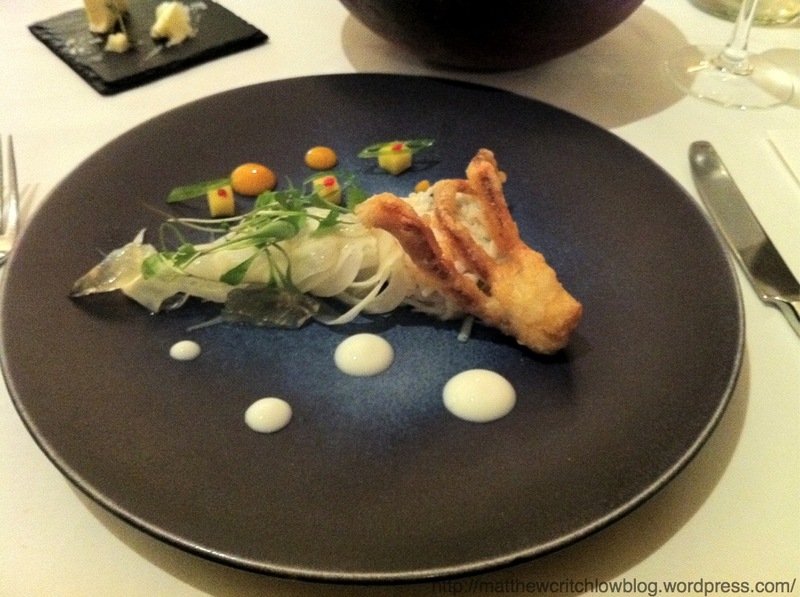 Crab salad, lemongrass jelly,Mango puree & tempura of soft shell crab. Now from reading this I noticed that some strong flavours were on the plate only to be further surprised when presented with the dish that the crab was dressed with a wasabi dressing and also had a fennel salad. Firstly the plate did look great with the small dots all working well and adding colour. When tasting the dish however my happy thoughts of how it looked quickly disappeared, my initial worries were confirmed with the amount of flavours trying to fight each other was just too much. The fennel immediately overpowered the lemon grass jelly and the wasabi just destroyed the crab to the point it could have been any protein and I would have not known. However the individual flavours were good, but this was in essence a poorly designed dish. 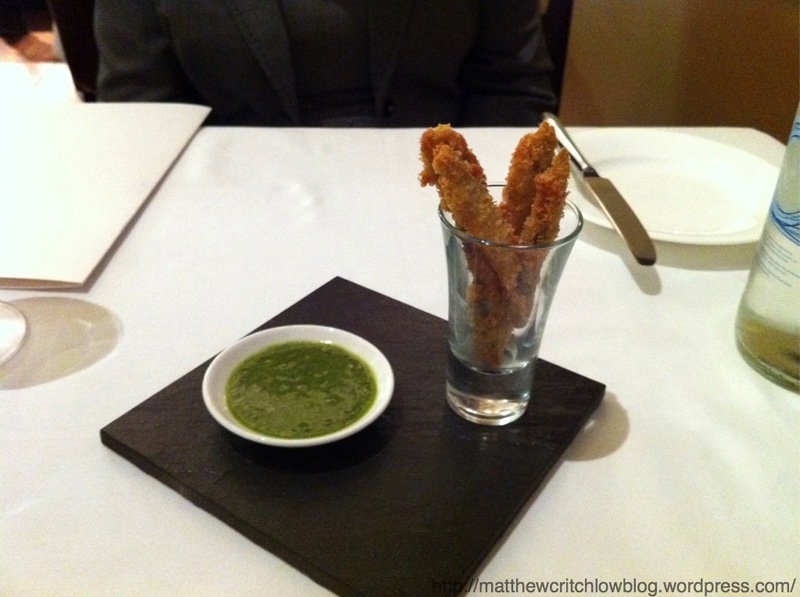 The tempura soft crab however was brilliantly crisp and strong flavoured. Ballotine of smoke ham & foie gras, Butternut squash chutney & potato crisp. This dish I was really looking forward to as anything with foie gras in I’m a big fan of being a particular favourite of mine, although when reading through the menu i was again slightly concerned with the marriage of flavours. Again these worries came true here, due to the ham being smoked the flavour was just so intense that if there was any foie gras the flavour could not be found which was a major disappointed. Overall the taste was pleasant, and If the menu had not stated frai gras I would have enjoyed this more, not having to look for that flavour. The ham was strong flavoured and smokey with the mango provided the sweetness, the crisp potatoes provided a good texture and were required to add some crunch. Pan fried scallop, Sag aloo & cauliflower carpaccio. The dish smelled brilliant, and also was pleasing to the eye, i let a out a sigh of relief as when the waiter served this he did not add any additional elements of the dish except which was said on the menu. The cauliflower carpaccio had a good crunch but not so much you knew the item was completely raw, and also had good flavour. 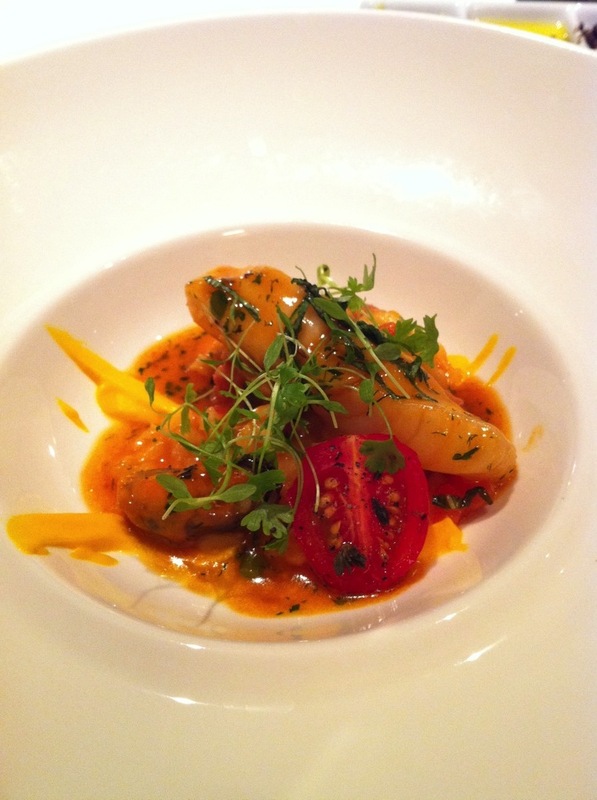 The Sag-Aloo was brilliant with the potatoes having a slight crunch, but the flavour was great and very intense. 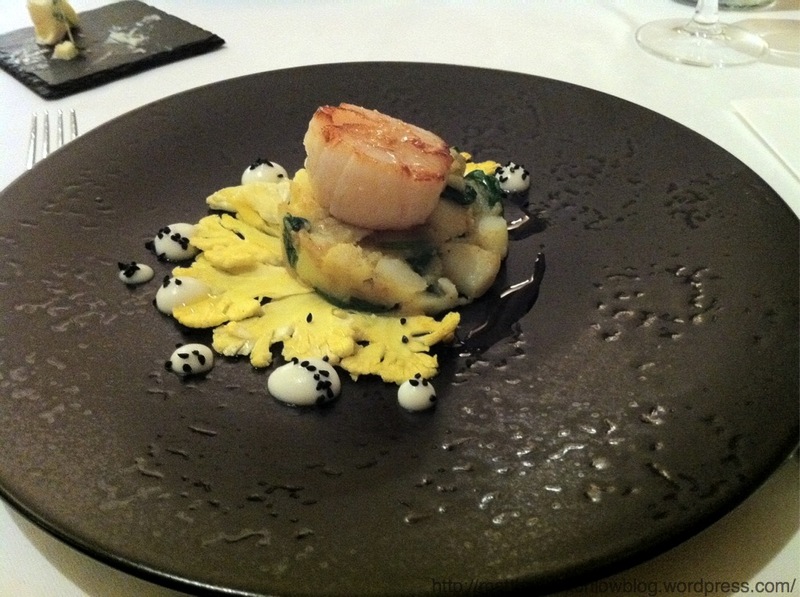 The Scallop is one of the best i have sampled of recent, it was incredibly sweet and cooked excellent. This was a simpler dish of what have seen so far and was great to see and so far was the only memorable item. 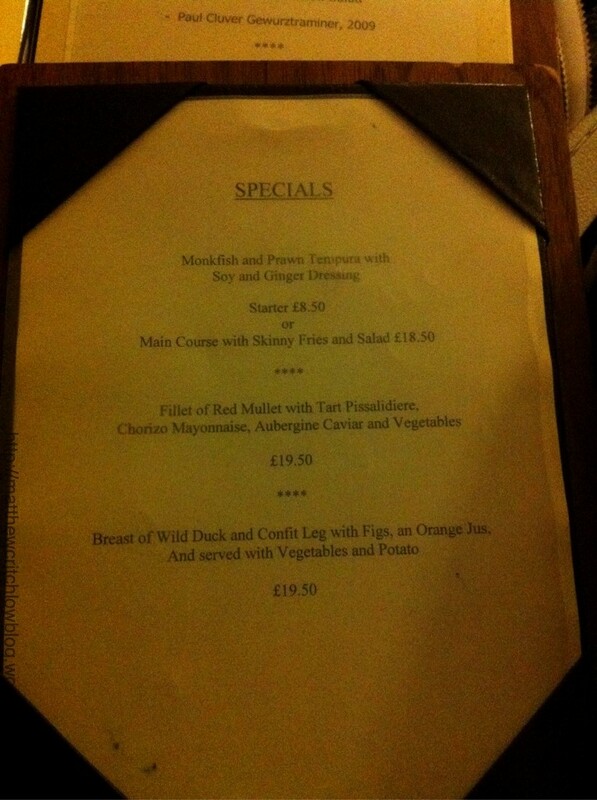 For main course I choose Venison, and my Mother chose Sea Bass. 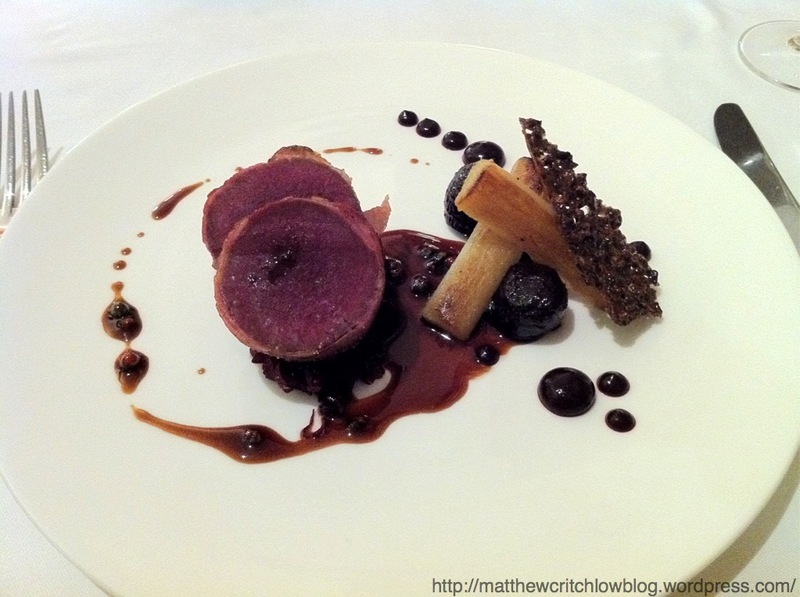 Roasted loin of venison, Spiced red cabbage, braised beetroot & peppercorn jus. The main course of the 7 courses was then served, immediately I noticed how rare the meat was and luckily I am very happy with meat cooked in this manner, however some might not be but this was mentioned when ordering. The Venison was cooked well and good and tender, however you just couldn’t find the flavour due to everything else on the plate, the spiced red cabbage below was something truly special with thoughts of Christmas coming to mind with the warm spices. The beetroot was extremely good and worked well, with the starch elements and the various dots of beetroot puree were great, but why oh why….. the peppercorn jus was just not needed and just added another element again which confused and meddled with flavours and would have been better left off with a little extra beet root puree, noting the red cabbage added its own beautiful liquid texture. My mum rated this a 6/10, she loved the liquorice taste but this was not that strong. 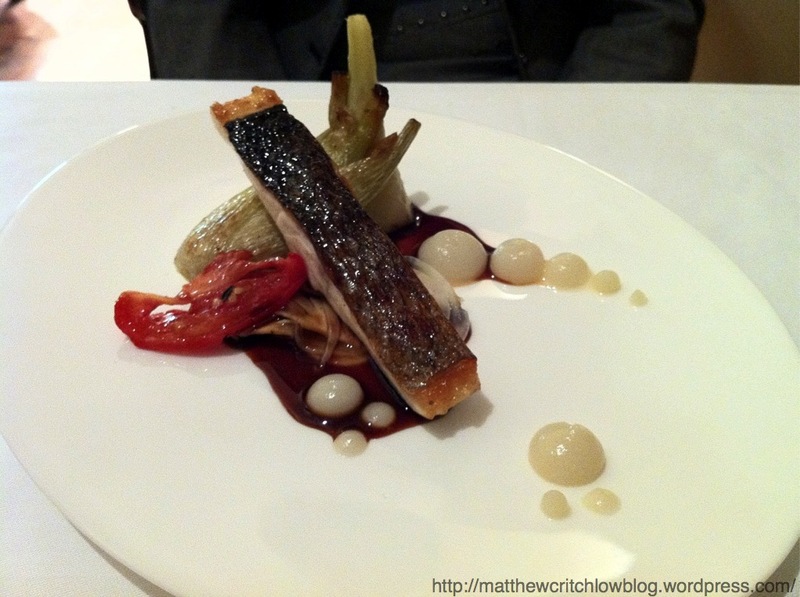 The fish was cooked brilliant with a great crisp skin but let down with the partnership of the vegetables. The moose was extremely light and had an extremely mild taste so much you could hardly tell it was there, the crumble placed atop of this might as well been left off as this was practically tasteless and provided no addition to the dish. The major let down of this was the compot in the base which was so full of blackberry seeds and so chilled my mother asked “Is this just for looks or can you eat it”, after calming from that amusing comment, I proceeded to taste and it was true it was solid, the taste was there however it was just to chewy to eat and more like a large placement of seeds at the bottom. Safe to say this was the star of the meal, i have never eaten such a lovely sticky, moist and light cake before this night, it was brilliant with strong stem ginger shining through, only could be made better served slightly warm. 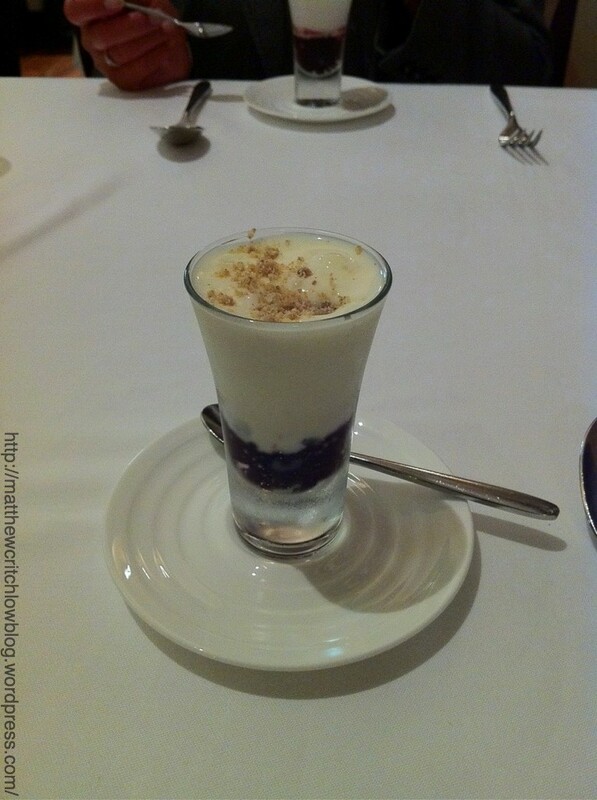 However the Ginger Pannacotta was no where to be seen, and was not worth mentioning on the menu. The Carrot sorbet was good but i feel a more strong flavour to compliment the ginger would have worked better such as a good Clotted Cream ice cream or something else with very rich/deep flavour. At this time coffee and petite fours were served, coffee priced at an extremely high cost of £4 each for a straight black coffee which I feel is extreme. 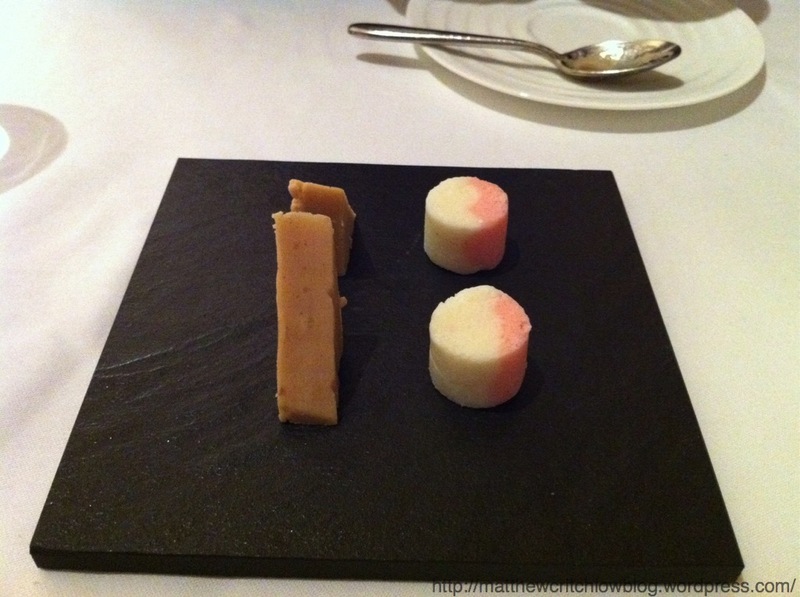 The petit fours were coconut ice which was very good and not to sweet and served chilled, the other was a Vanilla Fudge which was melt in the mouth and again very good. Total Bill was £123.50, with 2No. tasting menus, 2No. Coffees, 1No. Water and a 12.5% discretionary service charge which if this was by choice I would have not paid, more on this below. Overall – Im going to split this into food and service. 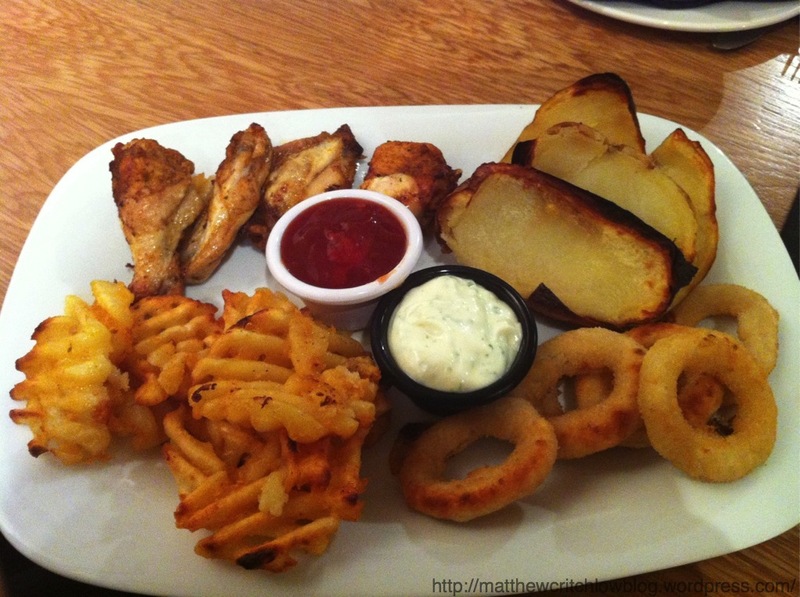 Food – 6/10. The food here shows alot of promise and the presentation of the plate is certainly high up there with the best, however I get the feeling that everything is just trying very hard to impress with more and more flavours hitting the plate it just becomes too much. I think the head chef needs to try and reign back his ingredients slightly and maybe try to have 1 dish on the tasting menu which he can experiment with. The food was all well cooked and good quality but seemed just to not all merge together at all. Service – 4/10. Service here is where the restaurant completely fails, and here are some example of things experienced on this evening. Waiters/Waitress – While not serving this would just be standing, and Hovering and staring waiting eagerly for your next move, it was just too much and not needed you felt almost rushed to finished to give them something to do. 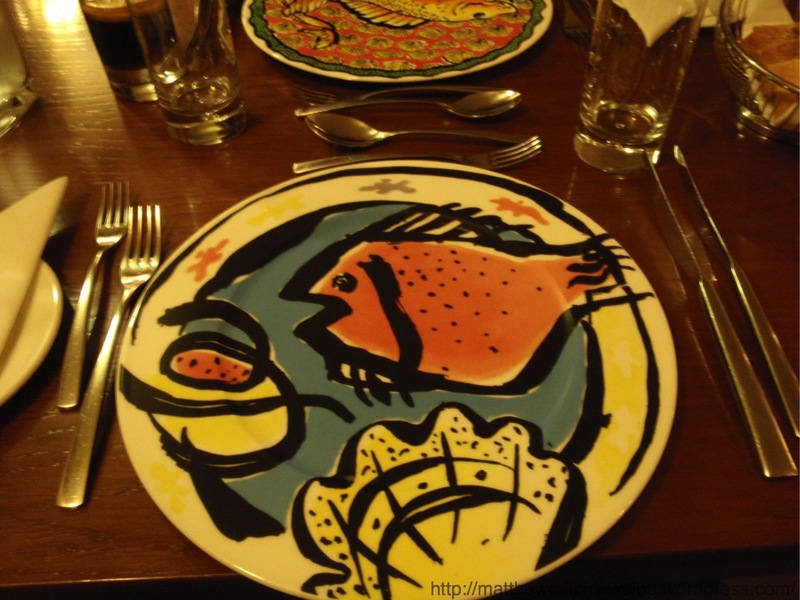 Clearing of Plates – This is something we experienced on every course, we would put the last fork full in our mouth and while still chewing we placed our forks on our plates, by this time the waiter was there taking them so quickly, we could not even thank him because we still had our mouth’s full of food….. They need to slow up and take some time. This is not a fast food restaurant and this is not needed. 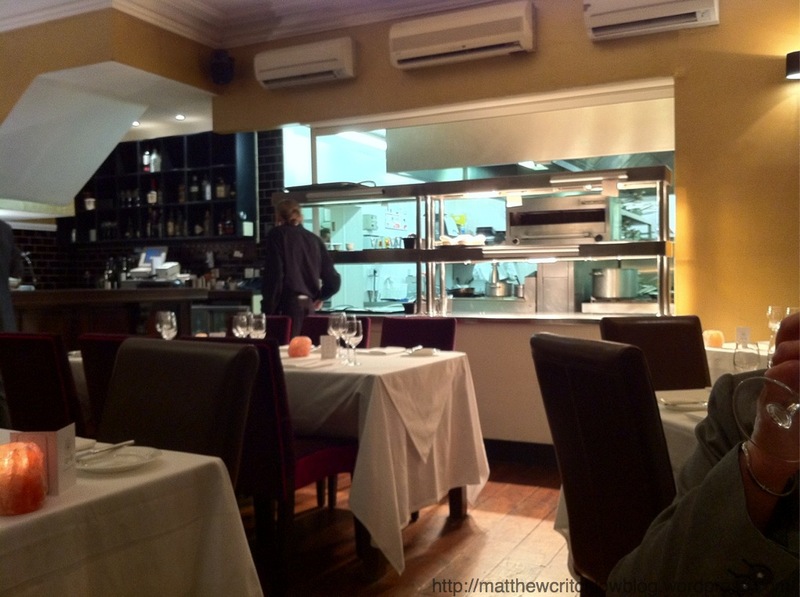 Food Speed of Service – Due to the fact the head chef is based in the dining room he is constantly watching the diners and awaiting for the next dish, which then causes him to race it seems. So you experience the speed of light clearing of plates, then by sooner than you have finished your mouth full, your next course is sat in front of you!. This is demonstrated by the fact we finished the entire 7 course tasting menu with the various additional samples, in under 75minutes!! !, are they turning tables or something here? as the restaurant was only half full and not needed. Due to the above do please make the service charge optional and not automatically added as its going to be questioned very soon. Overall Score – 5/10. Food quality good but needs work. Service a complete failure. I will try this restaurant again in a few months and maybe by then the service might have been sorted out. I am also very curious to see if “The New Angel” can retain its Michelin star in the future as with that service I am doubtful. 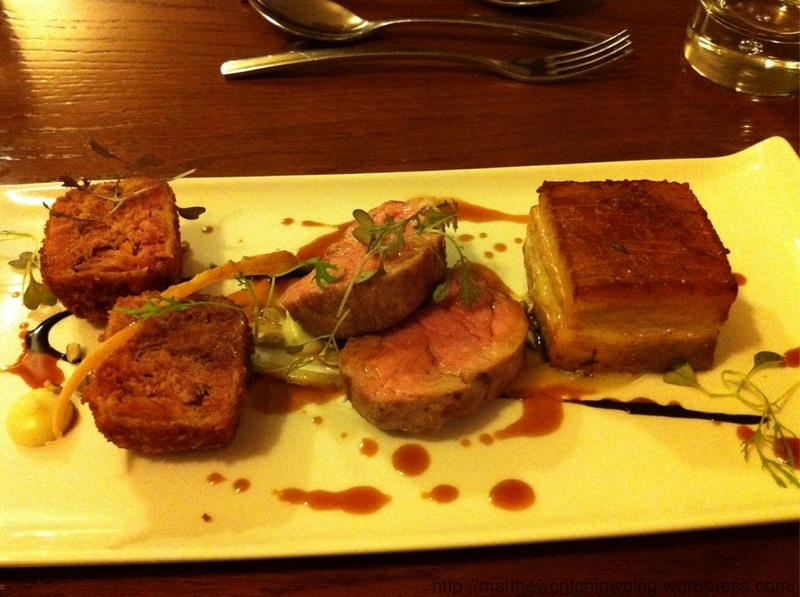 This is my third visit to this lovely little restaurant located in the small area of Topsham, being my third visit this review will be a combination of all my visits. On first glance walking past this restaurant in the main busy street of Topsham you could easily mistake it for a large town house, very minimalist signs locate you to the main entrance. Once inside you are immediately in the main dining area with a small corridor in front of you leading into the kitchen, and 2 small lounges to the left and right with tables and chairs. The restaurant seats about a maximum of 26 and inside is cleanly decorated with white walls and small warm lighting placed throughout. Tonight I am also dining with my family of Mother and Father. You are greeted by front of house “Sara” who is brilliant and very welcoming, from there your coats are taken and you are shown to your table. The tables are dressed in clean white clothes with nice silverware, and a small pot of green olives in the centre. Once seated and drink orders taken, menus were handed out. The menus are printed on standard A4 paper and are clean with around 4-5 selections for each course. La Petite Maison only offer a set menu with the choice of 2 Courses @ £29,95 and 3 Courses @ £35.95, both come with bread to start and coffee/tea and petite fours. 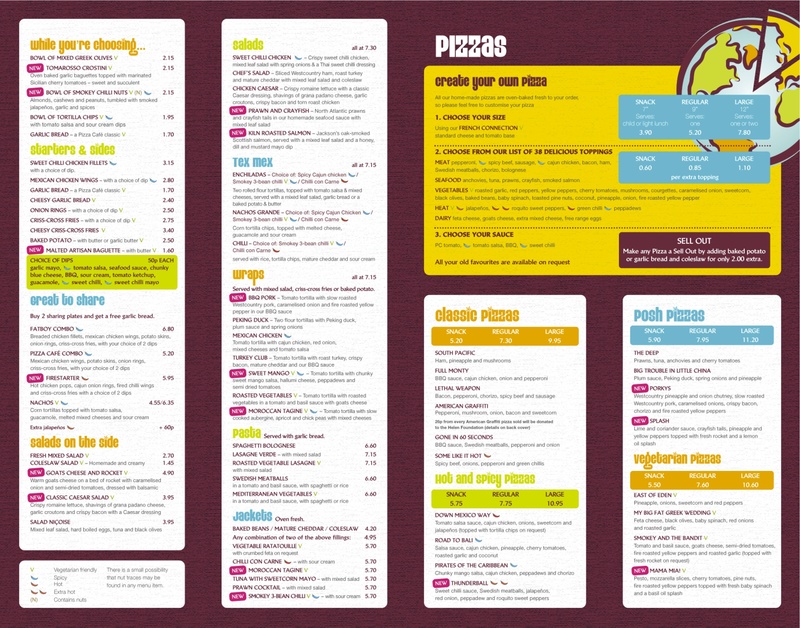 I do like how this works as it makes the menu look clean with only 2 simple price schemes, and the cost conscious of us are pleased due to they can select any dish of their fancy without having to worry about the cost as its set. The menus are printed on simple A4 paper due to the fact the menu changes every day and this is due to what produce comes in on that day, this is great and I admire restaurants who do this as it shows their ability to adapt and change with the seasons, and proves the chef cares about local produce. On this occasion I was immediately drawn to the Seared Pigeon Breast with Bacon, Foie Gras on toasted bread. Bread was then served on the table which comes in the form of a home made cheese straw, white hard crusted roll and a wholemeal soft roll. This was served in a small basket and was 1 item each for each person. 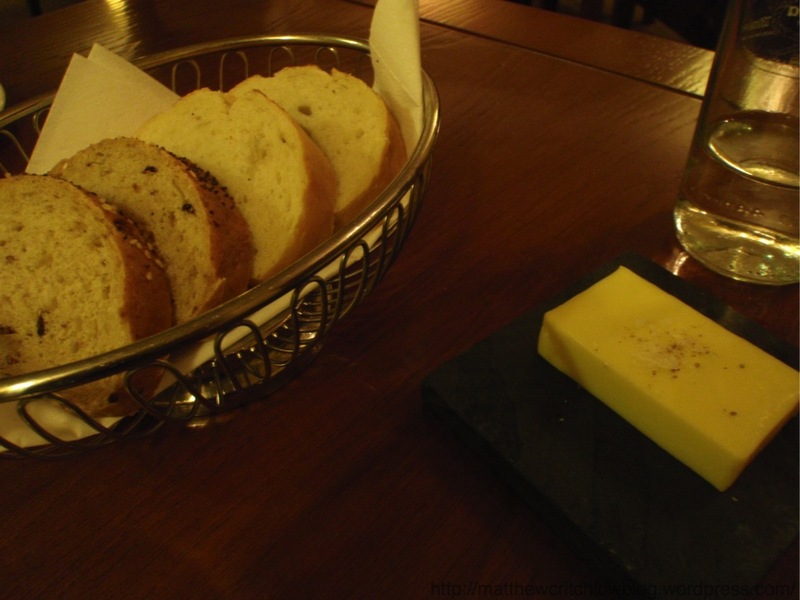 The bread is well made and is all done in house, with the cheese draw being very light with a strong cheese flavour. However the accompanying butter is a let down and does not have a strong taste at all, im not sure if this is home made or not. Within only 20mins my starter was served, my initial impression was shock at the shear size of the Foie Gras, used to the very minute portions served at previous restaurants. This had such an amazing taste and flavour its hard to pin point the exact reason for this, if it was the quality, cooking process or just the combination of the jus etc, the toast added a pleasurable difference in texture but this was unfortunately not crisp and had a slightly soggy bread element. The Pigeon was well cooked and served rare, myself being a fan of meat being cooked like this, however I can see someone else could find this a problem, I did however find that this lacked a great deal of flavour, and really did need the added Foie Gras and bacon to really provide the flavour elements. The small crisp salad was a needed light element to the powerful and heavy Fois Gras. My main dish of Roast Duck Breast, Confit of Duck, dauphinoise potatoes, Apple and Summer Greens, arrived only moments later. I requested my duck to be served Rare and this was perfectly presented as you can see from the photos, the whole dish was presented well. The apples provided a nice sweet element to the duck and help cut through the fatty duck taste at times, although the duck was very lean by all accounts, however I would have liked the apple ever so slightly more cooked as a crunch was present. The dauphinoise potatoes were good, but I found it lacked some cheese intensity although plenty of good buttery flavours exploded within the mouth. 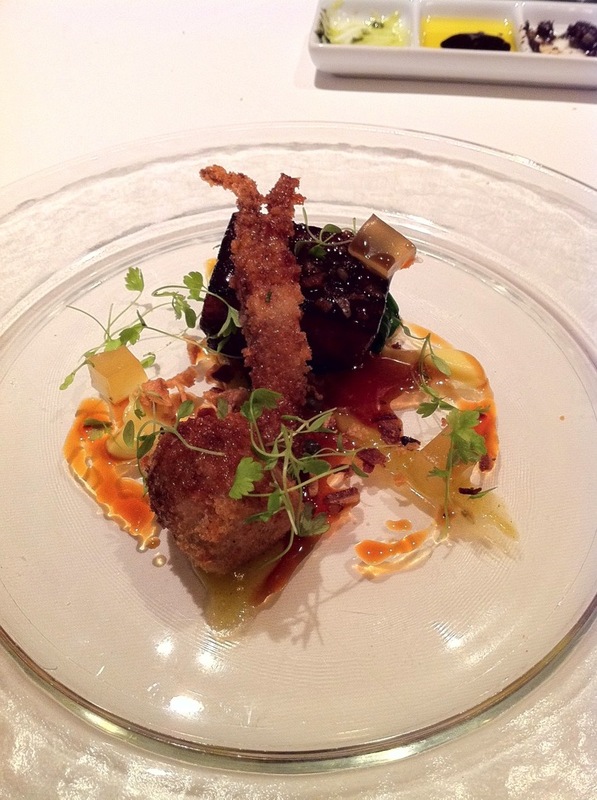 The confit of duck was brilliant with the crispy skin provided great flavour and the meat just falling from the bone. The service at this time also needs to be mentioned with Sara in constant eyes views just asking if everything is ok and constantly topping up of drinks, but without her presence being to much. 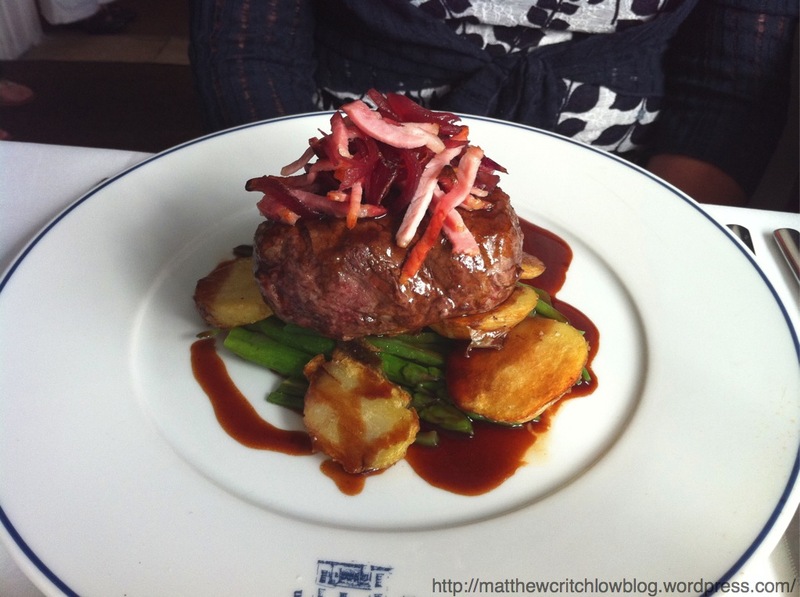 My mother at this time at Fillet Steak with Sliced Potatoes, Summer Greens, with Caramilised Red Onion and Bacon. This rated this 10/10 with the Steak being a perfect medium and the asparagus being lovely and still having a slight bite. 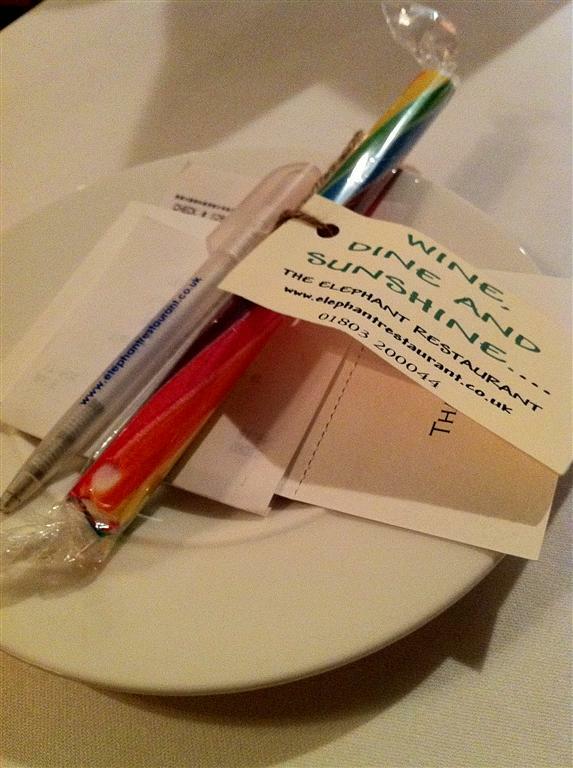 Now onto the favorite part of the meal…. Desserts. 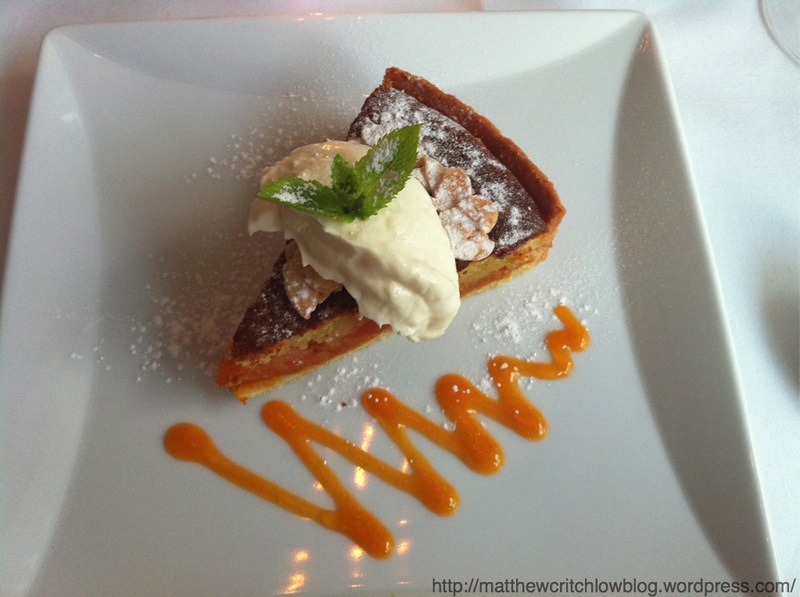 Having chosen the Warm Apricot and Almond Tart with Mascarpone Ice Cream, I couldn’t wait to see this as it sounded wonderful. 15 minutes later the dessert arrived and I was not disappointed with a very good portioned size slice of tart, with a large spoon of the ice cream placed on top which at this point had just started to melt from the heat of the warm tart. The accompanying apricot sauce was a great side and worked well. The tart itself was very light with a good crisp base of pastry which was sweet but not over powering, the sponge was quite light with large whole and half apricots spread along the base, and a thin layer of preserve in there also. 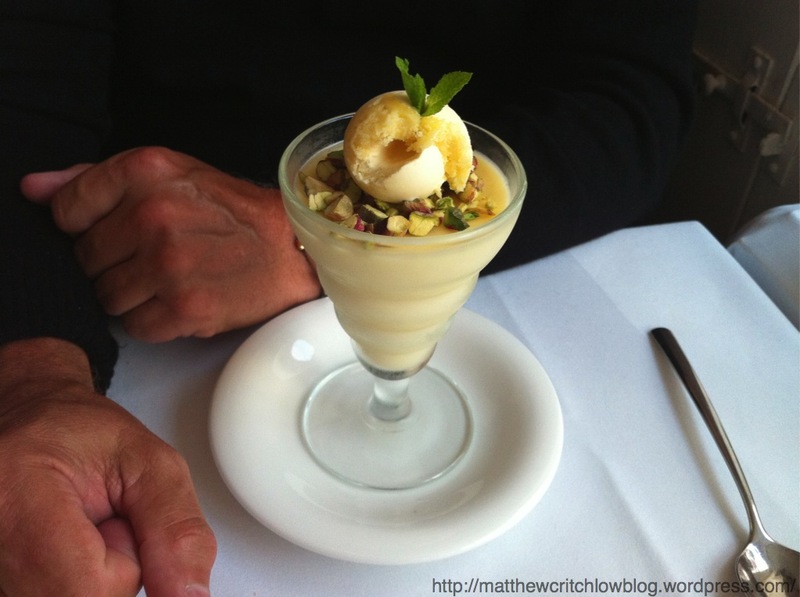 The Ice Cream was great and a good rich taste to go with the light tart. 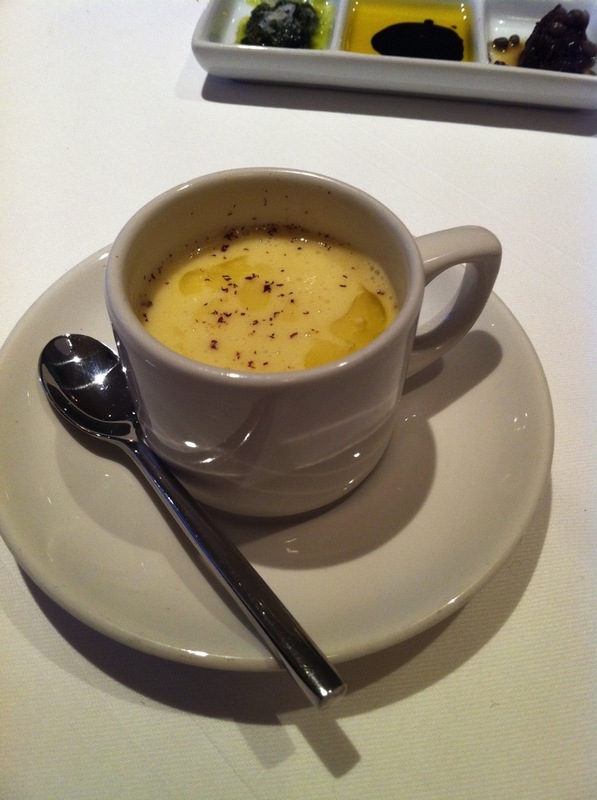 My Father had the Lemon Posset, he rated this 8/10, it was extremely light and not sour at all to the point where abit of tang could have been quite a good addition. This was also a good size portion. 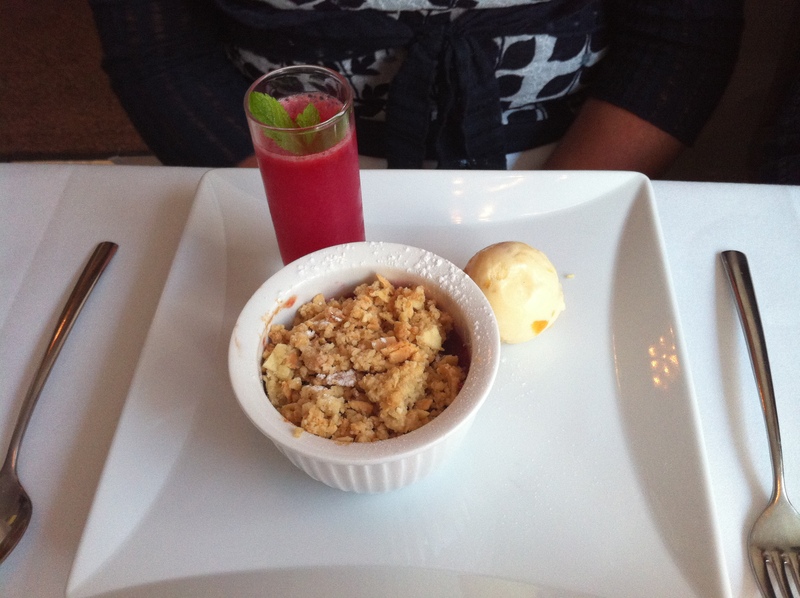 My Mother had the Plate of Rhubarb, the Crumble was great with a good crispy topping and a tartie rhubarb base to it. The shot of Rhubarb to me was extremely tart and to much for me, however my mum being a love of all things Rhubarb was an immediate lover. The great ginger ice cream mysteriously found half of its portion on my plate, now how did that happen?, this was great with whole pieces of crystalised ginger placed throughout. 9/10. Coffee was then served and was good quality, with some home made chocolate truffles also being placed on the table. These were deep, dark and rich and having just been removed from the fridge you only needed to touch them for the slightly moment to have a runny stream of chocolate pour down your hand. Very good chocolates indeed. The food is presented well with it not being to fancy or complicated, but still provided the visual shock of a very good plate of food. The front of house are great and the food is quick and speedy throughout with the food being great value for money. Will defiantly be coming back for more. Tonights restaurant visit is to 22 Mill Street located in the small town of Chagford. 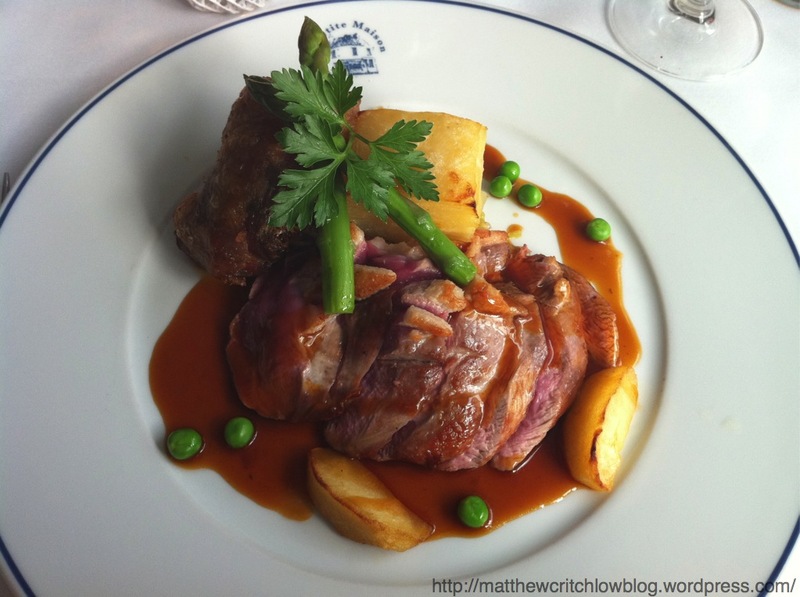 One thing which amazes me about some locations is how they seem to attract high value and good quality restaurants, for example “Bray” the location of such places as “The Fat Duck” and the “Waterside Inn (Soon to be visited)” not mentioning the other 1 or 2 well known restaurants. Chagford it seems is no exception being home to the very well known “Gidliegh Park” home of Michael Caine’s Michelin star restaurant, which amazes me how such a small village houses both of these amazing places, where some local town of “Newton Abbot” etc have no real spectacular places to mention. The restaurant is located just off the main village square, and Unfortunately as I found out has no dedicated parking and the village is not luckily enough to have plentiful local parking, however a 5 minute walk away is a small car park. Women should note though that the walk to this car park is not something that should be braved in heels. Upon entering you are greeted by the lovely “Chantel”, who is the head of front of house, and on this quiet Tuesday night was also the only waitress having only 2 other tables booked. “Chantel” is also the partner of head chef “Dave”, to me this is a great partnership of front of house and kitchen. After introductions and greetings you are invited into a small lounge area to sit and relax, drink and view the menu. 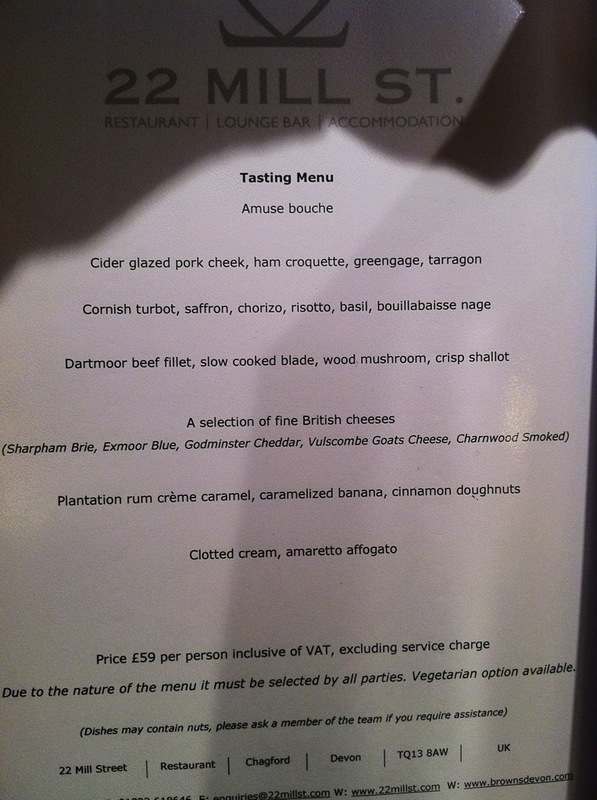 Having previously spoken to Chantel over the phone I already knew the tasting menu would be my immediate selection. After this myself and dinner partner (mother…. Being single sometimes one needs company, and beggars cannot be choosers) were shown to our seats in a lovely bright eating area with around 8 tables housing about 18-20 seats. This was a quiet evening with only 1 couple currently dining, this however was great as it allowed me to chat with Chantel and discuss the food. 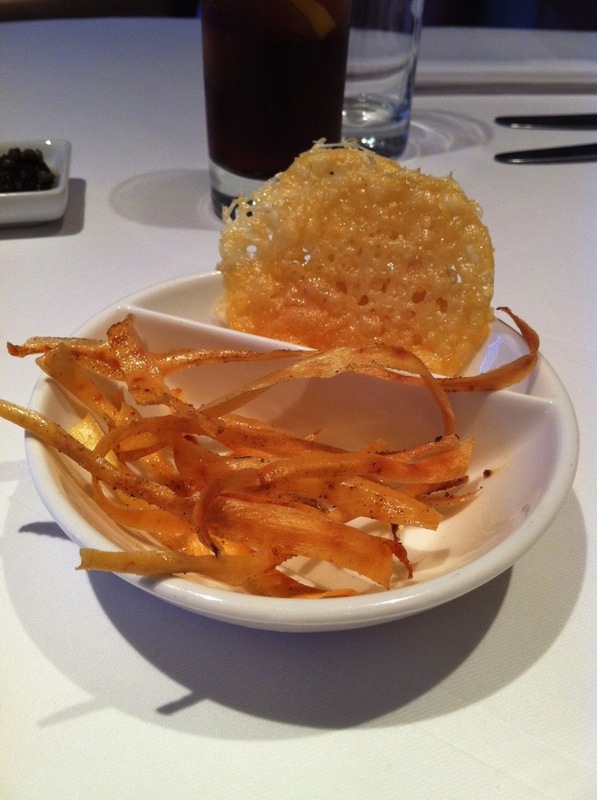 Immediately after being seated a small Amuse Bouche was brought over of “Parsnip Crisps & Parmesan Disk”, being not the greatest lover of parsnip I was not sure how I would find these, however I was surprised as these were lovely. They were lightly spiced and light as a feather, I only wished I could have hid these from the person sat next to me… The parmesan disk again was very light and strong flavored and reminded me of cheese and toast I used to eat as a child especially the very crisp edge bits with that slight burnt cheese flavour. The bread was then delivered which was a selection of fresh White loaf and a tomato brown loaf, both of these being served warm. These were fantastic with my favourite being the wholemeal tomato bread, the accompanying salted butter was also good being very creamy but surprisingly mild in flavour. 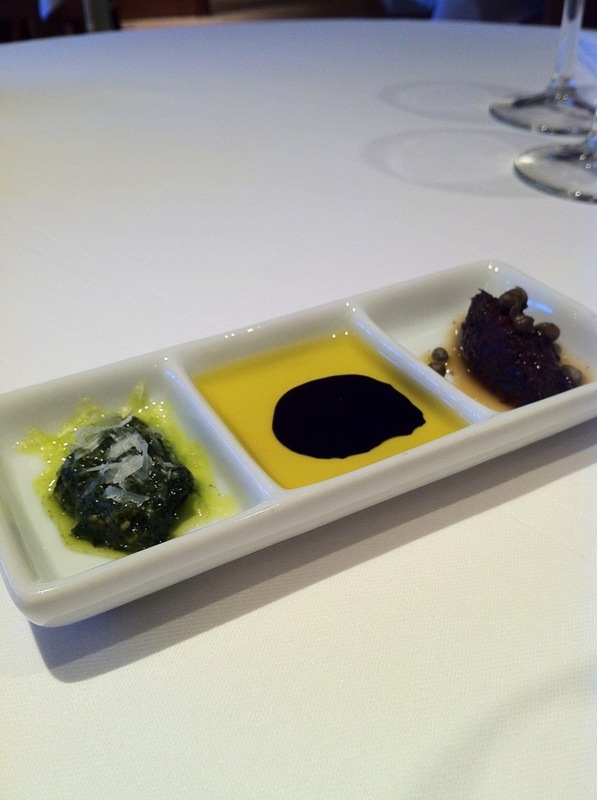 The dips/pastes as well were also well done, and were nice to be served along with the butter for a good choice. The second Amuse Bouche was then delivered of Cauliflower soup with truffle, this was so fantastic I can’t even begin to describe, and extremely rich. Using the delicate spoon to slowly and carefully sip the soup it was great, however the large bit of brown loaf was just calling to be dipped into the small pot. Now being in a fine dining restaurant I was resisting the urge to “dunk”, however Chantel came over and encouraged me to “enjoy the food how you want to enjoy it”, which to me is how it should be and I proceeded to “dunk”…. I was in heaven. When the dish was presented I was immediately impressed by the presentation, the small leaves used to dress the glass plate with the smears of sauces showed things off well. I was very surprised to find the “Crisp Pig’s Ear” rested on top of the dish, as this was not stated on the menu, however I did find this was not crisp and the outside cracking was very soft and extremely chewy, however the taste was superb. Moving onto the Pork Cheek, this was the most tender piece of meat with the most intense flavour I have sampled in a while, with the meat just melting in the mouth and the cider really punching in your mouth. The Ham Croquette, was also very good however with the sauce been poured over this, the crisp exterior had now been replaced with a slight soggy bread crumb effect. Overall the dish blended well with the textures and flavours all resulting in a very good dish, and a extremely good start to the main event. 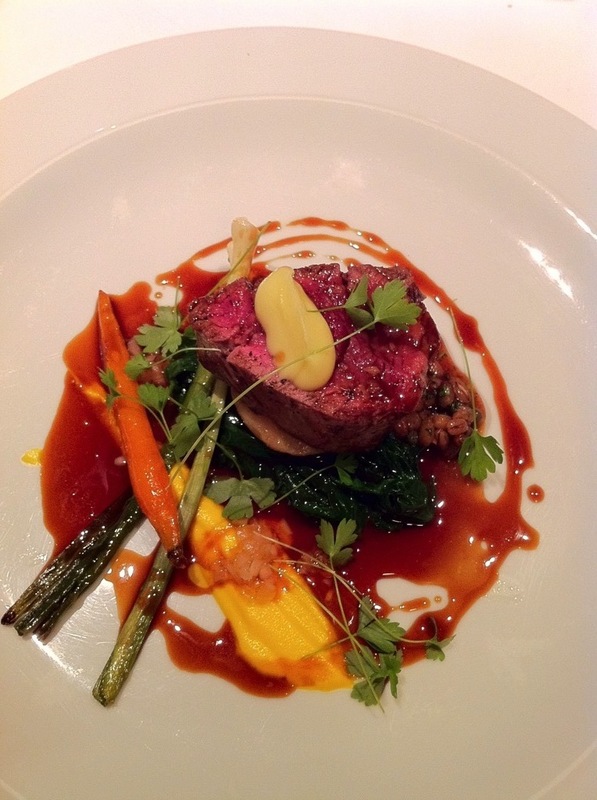 The dish had the most striking yellow colour, which would impress anyone on first glance. The fish which was cooked to perfection just fell apart, which showed the risotto placed underneath, this was executed well however I found the Chorizo overpowered the delicate flavour of the fish and was too pronounced on the tongue. Having requested my Beef “Rare” I was pleased to see this was cooked as I requested, however my Mother’s beef which was requested medium was still slightly under for what I class as medium, this is down to personal interpretation though. I was surprised to find Barley placed under the beef blade which is a rarity to see on todays plates, and provided the starch element of the dish, this was a good surprise and proved to be one of the most well executed part of the dish. The shallot puree however I found extremely salty, which then continued to overpower even the most dominant of flavours of the beef etc. 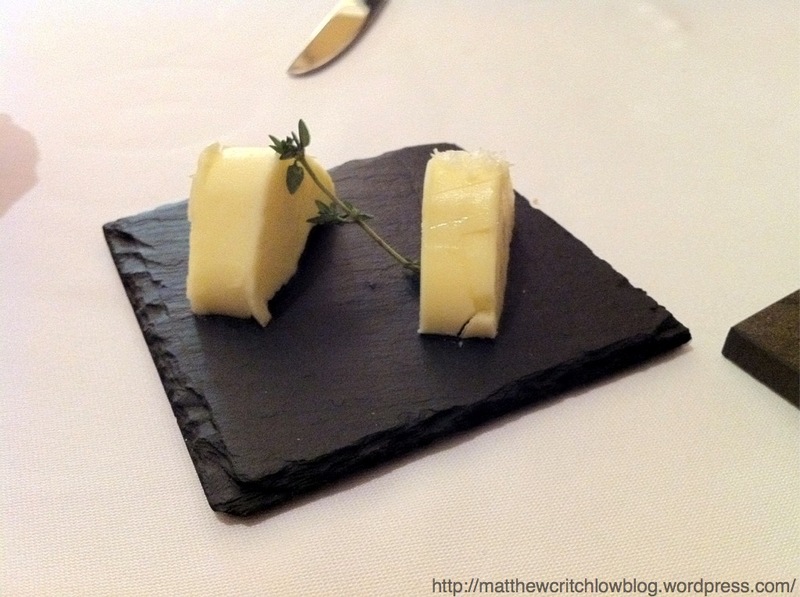 Unfortunately I will point out that I am not the greatest cheese lover and if a cheese course is optional I will normally avoid, this could be due to the fact I am unsure how to taste cheese and find the flavours all to dominating, which reminds me to try and find a cheese tasting master class. The board was well presented on a wooden block, with home made oakcakes which were truly amazing and crisp, fresh grapes, and small squares of the above cheese. 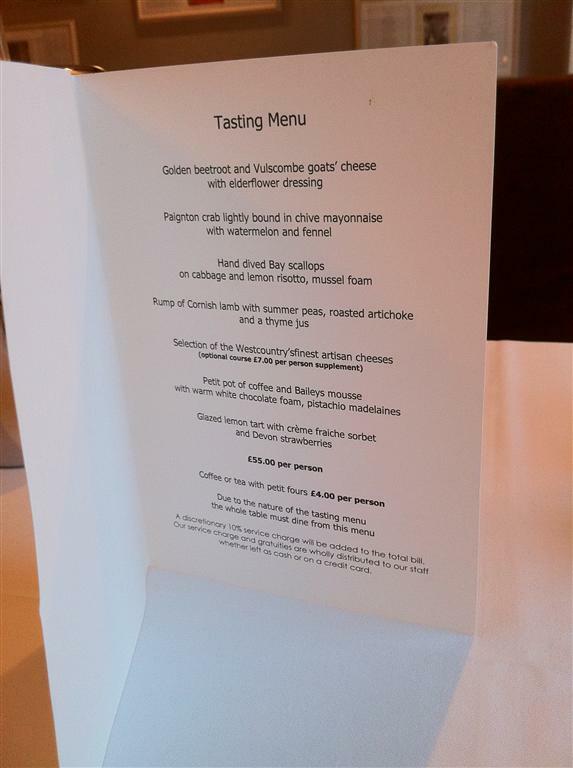 I tried all the cheeses on offer and did enjoy this as much as any cheese reluctant person can, however upon trying the Exmoor Blue this tipped me over the edge with the burning in the throat sensation still strong in my memory and I called the cheese course a day there. This was one of the main disses I was looking forward to, being a desert lover. The Crème Caramel had a subtle flavour of rum which personally I think this could be given an added “Umph” to try and show what this flavour really can do. 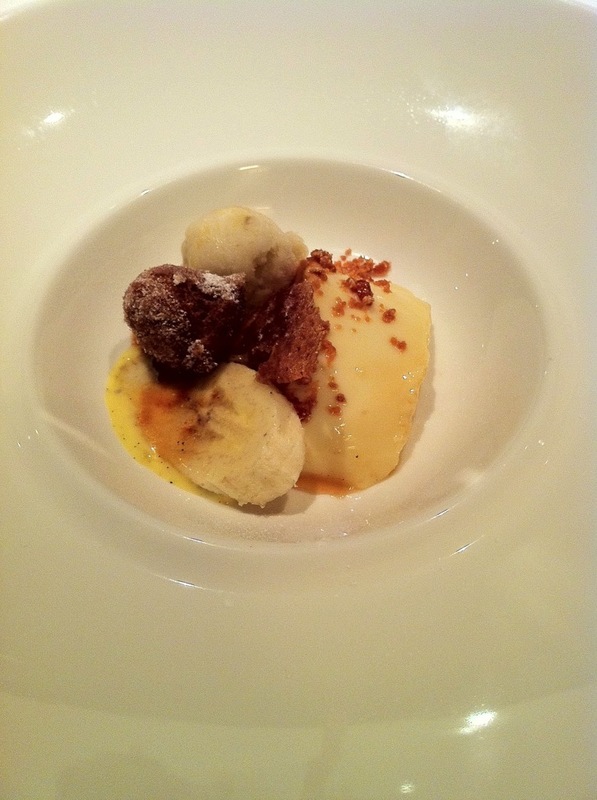 The banana was slightly disappointing as this was quite undercooked, and only had the most slight hint of caramelisation. Now being a very big kid at heart the crisp doughnut was saved until last, I was extremely happy I took this approach as this was fabulous, not greasy at all, very dry but still ever so slightly moist inside. Now due to the way this dish is served (Hot Amaretto Coffee poured over Ice Cream) I was too excited and also concerned about the ice cream loosing all structural stability to wait and grab the camera. This dish however was brilliant with Chantel, pouring on the hot coffee at the table and leaving the coffee/amaretto filled jug on the table to allow for additional topping up of hot coffee. I was amazed how well the clotted cream ice cream was done, with the rich and deep flavour being very pronounced and was a brilliant and light ending to a very large meal. Coffee was then ordered and a brilliantly hot black coffee was served and this was enjoyed, however I was slightly disappointed as no petit fours were served. This is myself being greedy as my belt was bursting, however I always think its nice to be served something small even if only to request for it to be taken home to be enjoyed the next day and continue the fabulous dining experience. An extremely good meal was had at 22 Mill Street, made even better by the wonderful front of house team of Chantel (Only). It concerns me slightly that if all of a sudden many off street diners did decide to come and dine that evening and Chantel being the only server, things could get slightly out of hand, but im sure a plan is in place to allow for this. The food was carried out well, with only some small down falls and with only such small down points there would be not worth mentioning to most, however I do feel the biggest let down for myself was the Crème Caramel which I believe does still need some work. The Bill came to a total of £128.64 which for 2No. taster menus, 2 Coffees, 2 Large bottles of water I think is very good value. Cant wait to return and sample the new November Menu, and look forward to seeing Chantel and hopefully meet the chef Dave on my return.